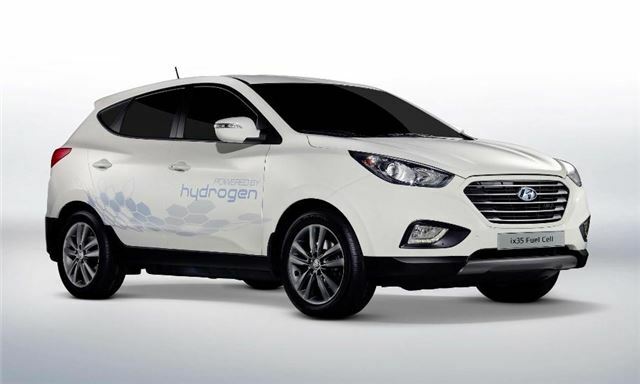 Production of the Hyundai ix35 Fuel Cell for public and private lease will start in late 2012 – that means it’s the first series production hydrogen fuel cell vehicle. Plans are for mass production from 2015, with 10,000 models set as a goal by the Korean company. The vehicle is powered by hydrogen in the form of a fuel cell stack. This generates electricity, charging a lithium-polymer battery, which then powers the electric motor. The tailpipe emissions are just water and refilling takes mere minutes as opposed to the long charging times for pure EVs. The range is 365 miles and performance is fine for everyday use – top speed is 100mph and 0-62mph takes 12.5 seconds. The fuel-cell vehicle is based on the familiar ix35 so it’s practical and easy to drive. It’ll be produced at Hyundai’s Ulsan factory in Korea.